Recently I read (and watched) a story about the first lie the author ever told as a child. Years later, the author — now a teacher — still vividly remembers the experience. Reading his story, I realized that my own first lie is just as indelibly branded on my memory. I was four years old. It was my family’s first year living in a tiny cabin next to the Stikine River in British Columbia, where we trapped furs for income, hunted and fished for meat, and grew a huge garden full of vegetables that we preserved for winter food. In that remote place, there was no electricity, unless we used precious fuel to run a generator — something we did only on laundry days to run our ancient cylindrical wringer washing machine. A beautiful Singer sewing machine. 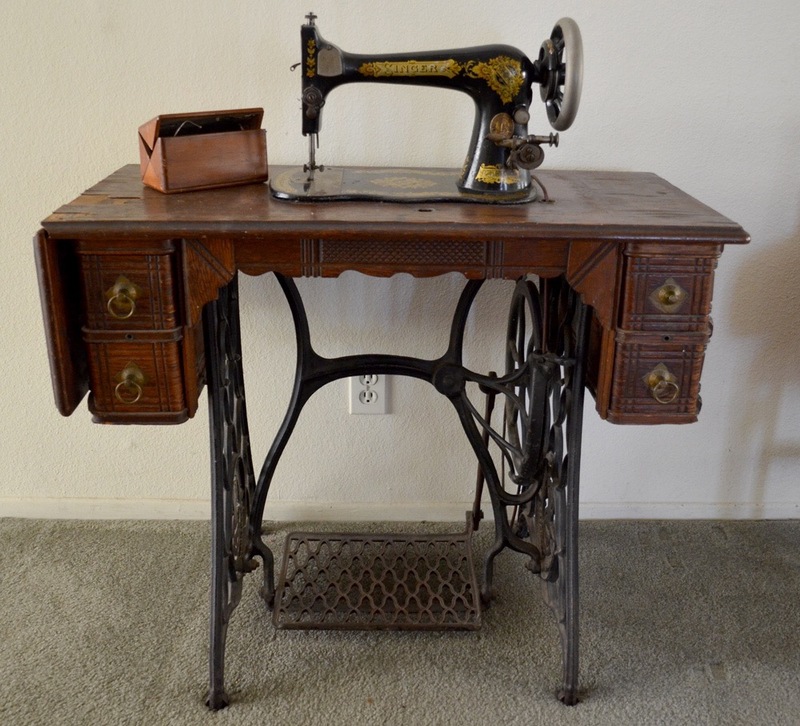 I loved the whir of the flywheel and belt and the rhythmic thump of the treadle when my mom sewed. But most of all, I was fascinated by the shining blur of the speeding needle. My mother had been sewing one afternoon while I watched, when she found she needed something outside. “I’ll be back in a minute,” she said. “DON’T TOUCH THE SEWING MACHINE.” I had just learned how to time one minute on the clock. I sat myself down on a chair below the pear-shaped wooden clock my dad had made, and kept my eyes fixed on the second hand. It went all the way around one time, but my mother was nowhere to be seen. Perhaps I’d been mistaken in my attempt to count off a minute. I watched again. Still no mother. Clearly, she had gotten lost and was never returning. I could touch the sewing machine. I approached the shining, forbidden machine slowly, carefully. Reached out one finger. Stroked the painted design. Strummed the leather belt. Examined the shining silver balance wheel (that’s the small wheel at the end of the head, for those that care). I gloried in the machine’s beauty, now all mine. Finally, I ventured to touch the most dreaded part of the never-to-be-touched sewing machine: the needle. I slid my finger under the point, relishing the delicate scratch of the sharp tool. Then I rested my finger below the needle, on the toothy feed dogs (the teeth that pull the fabric forward), and eyed the wheel speculatively. When turned by hand or by the belt connected to the treadle down below, the silver balance wheel put a series of hidden cogs into motion, causing the needle to flash up and down. I’d seen my mother turn the wheel many times with a practiced hand, to position the needle correctly or to boost the motion when starting a seam so as to put less strain on the leather belt. I was tall enough to stretch one hand to the wheel while resting my finger under that seductive needle. My mind raced with the possibilities. Finally, motherless, I could do what I’d always (I now knew) wanted to do: race the needle. For years afterward, I believed that I’d successfully convinced my mother that I hadn’t touched the machine. I wrestled with guilt and shame: I had lied to my mother. I had deceived. I was almost certainly going straight to hell. The experience was so wrenching — the lie, not the gash — that I never lied again. Ever. I bent the truth slightly on occasion; I evaded; I distracted and misdirected when necessary; but I never a lie. To this day, I can’t do it. It’s simply impossible. I relive the horrified, ashamed ache in my belly that came with the lie, and I just can’t manage it. And it’s all because I was betrayed by a beautiful piece of mechanical art. It strikes me that this is an excellent example og the joy of natural consequences. I not only didn’t have to punish you for touching the sewing machine, but I also didn’t need to reinforce the injunction about lying. Two birds, one stone, and I was relieved of the necessity of casting it. Indeed! I STILL can’t lie. That experience scarred me hopelessly! Unfortunately, Niko’s conscience doesn’t bother him so much when he lies. He’s upset that he gets in trouble, not that he lied. But to do him credit, lately he’s been backtracking quickly and correcting himself when he tries to lie, so maybe it’s sinking in…? Most small children have a hard time understanding the concept of lies. They know they shouldn’t do it, but they’re not sure exactly what it is. Niko’s learning by trial and error.